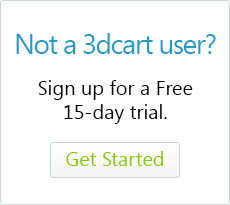 Most of the 3dcart themes will allow you to display a "browse by price" area of the store. This feature allows your customers to search for products by price range. The price groups (browse by price) feature can be modified to fit your needs. This tutorial will show you how to make all customizations associated with the browse by price function. By default, your store's price ranges are labeled using numerical value amounts like $0 - $24.99. However, these titles can be changed to fit your respective needs. Within the "Home Page" section, locate the "Hide Browse by Price" checkbox. Edit the Title of each bracket you would like to change. By default, your store's price ranges are arranged to include basic price group ranges. However these ranges can be tailored to meet your specific needs depending on the pricing your products use. Edit the Low Range and High Range of each range you would like to change. When specifying ranges, be sure to include incremental cents between the different ranges. For example, you may want to specify your first low range as $1 and your high range as $10. However when you get to the second low range you specify $11 as the low range and $20 as the high range. The problem with this set up is that there is no range for the store to include items that are priced between $10 and $11 (i.e. $10.01 through $10.99). Therefore, you will need to specify those mid ranges in either the low or high ranges. This way, your items that have incremental pricing will also be showcased in their respective ranges. By default, we've listed the browse by Price ranges in ascending order from low to high price ranges. However, for your store, you may want to reverse this to display in descending order. Edit the Order field of each range you would like to change. Lower numbers will display before higher numbers. You may need to add more ranges to the Browse by Price area in order to offer a more finely tuned range of price search options for your shoppers. Look towards the top right of the page and click the +Add button. Type the title of your new search range in the Title field. Type in the low number for the search range in the Low field. Type in the high number for the search range in the High field. Remember to specify incremental ranges for cents as explained previously! Type in the sorting display number in the Order field. Lower numbers will display before higher numbers. Click Remove next to the search range you would like to delete. You can also rename the Browse by Price menu header to anything you would like it to be. Use the search language bar at the top of the page and search for "byprice"
Click Save at the top right of the page to commit your changes.